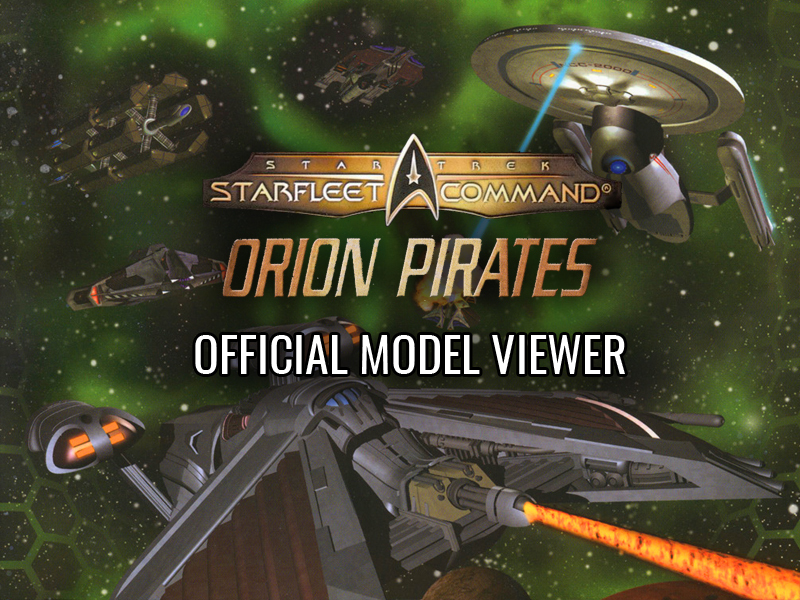 This is Taldren's official tool for viewing .mod files from Star Trek: Starfleet Command I, II, Orion Pirates and III. The .mod file viewer is a simple application that displays the .mod format model files used by the Starfleet Command series of games. It reads and displays models for Starfleet Command I generation games (Starfleet Command, Starfleet Command Gold, Starfleet Command Neutral Zone) and Starfleet Command II generation files (Starfleet Command Volume II: Empires at War and Starfleet Command - Orion Pirates. The only difference between these generations is that Starfleet Command II models also use a self-illumination mapping channel. You can use this Viewer to rotate models, zoom in and out, and check their Level of Detail (LOD) versions. Rotate the model by left-clicking and dragging (any direction); zoom in and out by right-clicking (up=in; down=out). *"Automatic" (the default) uses the Level of Detail versions of the model the same way the game uses them. As you zoom out, te next lower LOD (if available in the model) will swap in. *LOD1-LOD5 will force the selected LOD to display. If only one LOD is present in the model, the rest will be greyed out. SFC models typically use three LODs excpet for the .brk, or "break" models, which have only one. SHADE MODE - lets you select the rendering style to display. "Smooth Shade" is on by default and is typically the only one you'll need. "No Shade" and "Flat Shade" are also available and you will play with them even though we've told you you don't need to. *POINTS - Displays just the verteces of the model. *SOLID - Is really the only mode you need, but ever since the Shade Mode thing we don't even bother telling you that any more. Okay, Wireframe is sorta cool. REFRESH - Reloads the current model; handy if you're making changes to it in the background. RESET CAMERA - If you get hopelessly lost zooming out and rotating, this will bring you back to an initial view. RENDER WITH ZBUFFER. This is on by default. You typically have no need to.... oh, forget it. SHOW DECALS - Not applicable. SHOW SURFACE NORMALS - Will display the direction of the normals on all polygons. SHOW VERTEX NORMALS - Okay, this is a matter of debate. The Taldren Art Department maintains that it is impossible for a vertex (which has no size, only a position) to have a direction. I mean, think about it. A direction in relation to what? An object with no size can't be facing more *one way* than another, right? With what? On the other hand, the Taldren programmers believe that a vertex can have a direction. The 3D Max programmers also believe this. Programmers love to sit around the Playstation and debate how many verteces can dance on the head of a pin. You're just going to have to decide who to listen to on this one. Anyway, this menu item turns the display of Unprovable And Really Fundamentally Ridiculous Vertex Normals on and off. (For a real treat, turn surface normals and vertex normals on at the same time). Just displays an "About" box. Hey, it's an internal development tool. This model viewer is an internal development tool that we are sharing with Starfleet Command modellers. It is not public domain - you can't resell it - but it is freely distributable, so long as this text file accompanies it on its travels. Because it is an internal tool, we do not guarantee its compatability with your computer system. It works fine everywhere we've used it. That's about all we know. We have no reason to believe that running this software will transmogrify your computer into a Vic20. If it does, however, it's not our fault (though it's sure interesting). Basically, use at your own risk. Keep arms and legs inside of Model Viewer at all times.